Today, I looked at a resume that a recruiter had submitted for a job opening. After reading the resume, I refused to give the candidate an interview. The candidate was clearly not a fit for the role and I wasn't willing to waste my time and energy interviewing someone who I definitely was not going to hire. A couple of days ago this same recruiter noticed that a lot of his candidates were getting rejected without even getting an interview. He reached out to my colleague and I expressing his concern that he wasn't meeting our needs. Here is a portion of what I told him that he and his compadres needed to do differently if they wanted to have an higher success rate with the people they are trying to get hired. If you are a recruiter, consider what I say below. If you are a job seeker, pay attention and do what you can to fix this situation on your own. And, while some of this is specific to project management roles, consider your own field of expertise and apply these lessons to your resume. Regarding several recent candidates from your company and others, here is what I have seen. Candidates whose Project Management experience is legitimate, but not sufficient for this role (this is a Sr Enterprise Project Management role). They are a tier 1 (Jr/entry level), tier 2 pm, or tier 3 (Sr PM), and lack the experience that a Senior Enterprise PM typically brings to the table. Their resume experience does not reflect experiences where they had to display key PM skills such as project planning, risk management, issue escalation, stakeholder management, etc. Often these latter are people who have held roles as Business or Systems Analysts or Project Leads. Those roles may give them some PM skills, but it is not the same as actually having the PM role. Many of these are people who were asked to act as the PM while also working as an individual contributor in the project. Experience has shown that people in this situation are exposed to PM deliverables and skills, but have not had the opportunity to develop those skills to the level required to manage a project of the size and complexity that we are handling here at FutureCore. They are an entry level PM, at best. Resumes that use hyperbole (Dictionary.com defines hyperbole as obvious and intentional exaggeration. “Excellent” skills – excellent compared to what – a shoe shine boy? “razor sharp focus” – is anyone going to say they are unfocused? “skillfully apply” – would any candidate note a skill in their resume that they applied clumsily? “highly effective” – how high is highly effective? Did it have an ROI of 500% or 5%? I suggest you purge your candidates' resumes of these kind of adjectives. They convey ego, not facts. I suggest that you get your candidates to put cold, hard numbers into their resumes wherever possible. a. Ignore the skills mentioned in the resume summary and carefully scrutinize the experience to see if they actually delivered PM deliverables (accomplishment vs responsibilities). b. Did they actually hold the title of Project Manager? c. Does the resume lack hard facts? ii. Do they list responsibilities instead of accomplishments? Just because someone was supposed to get something done, doesn't mean that they actually accomplished anything. 2. Pre-interview the candidates to ensure that they actually have experience at or above the level required for the position. 3. Ensure that the candidate can clearly articulate his/her relevant experience (this applies to any candidate for any position). If the candidate is unable to quickly (< 5 minutes, preferably < 2 minutes) and clearly cite specific experiences that answer interview questions their actual experience will remain unknown and they are unlikely to progress to an offer. Coach your candidates that even when asked a hypothetical question (e.g., “how would you …?”), instead of saying what they would do, they should respond by pointing to a specific instance in their experience where they handled this kind of situation. They should explain the situation, what they did, and what resulted from their actions. Even for interviewers who habitually ask these (in my opinion worthless) hypothetical questions, answers that highlight actual experience over theory are more impactful. Hypothetical questions and hypothetical answers are, in my view, only useful when interviewing an entry-level candidate. If I am looking for a potential performer who has little actual experience in the role, I might resort to hypothetical questions. Usually, even in those situations, I can ask questions that reveal situations where the inexperienced candidate has actually demonstrated the qualities I am looking for. Unfortunately, many interviewers have never received good training in how to interview in ways that allows them to uncover the relevant experience and aptitudes a candidate has to offer, so these hypothetical questions are very common. When a candidate tells me what they “would do” or “typically do” (the latter is slightly better), they are talking theory rather than experience. If it is a phone interview, for all I know he or she might be using Google while on the phone to scan the high points from an online article to answer the question, or they may be relying on what they learned in a class. In either of those instances, they are talking theory because they have never actually done it. When the candidate says what they “typically do”, that is a stronger response, but it still lacks the validation that comes from telling about a relevant experience and what they actually did do. "We speak" is very common. We are so indoctrinated that "there is no 'I' in team," that we often talk about our experiences through the lens of what the team was supposed to do and what they accomplished. Unfortunately, in a job interview this kind of talk hides the candidate's skills behind a smoke screen of team actions. Coach your candidates to avoid using “we-speak”. They should be very clear to delineate what the team (“we”) was asked to do, and what the candidate (“I”) did. I know that we are all indoctrinated in team mentality and not hogging glory, but the individual is being hired, not the team. Personally, when a candidate consistently says “we”, and fails to tell me what “I” did, I read that (right or wrong) as someone who is trying to benefit from what others on the team did, regardless of how little the individual actually contributed to the success of the endeavor. We need individuals who can pull their own weight, not people who rely on others in the team to make up for their weaknesses. Most candidates who have interviewed with me will tell you that at some point I probably stopped them and asked them to tell me explicitly what they personally did and how it came out, rather than what the team (or we) did. So, that is my advice to recruiters so that they can get more of their candidates to get interviews and increase their chances of getting an offer. What do you think? As an individual job seeker, did you find anything there useful? I hope so. I know that there is lots in there that you can use. And, if you are working with a recruiter to get your next job, be aware of the things they do (like what I mentioned above) which unwittingly sabotages your efforts to get the job you want. 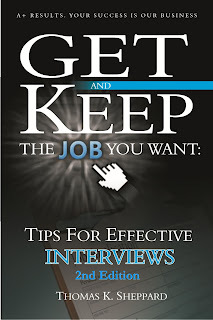 I read the first version of this book several years ago and I found it invaluable in helping me to learn how to interview effectively to get the job I want.